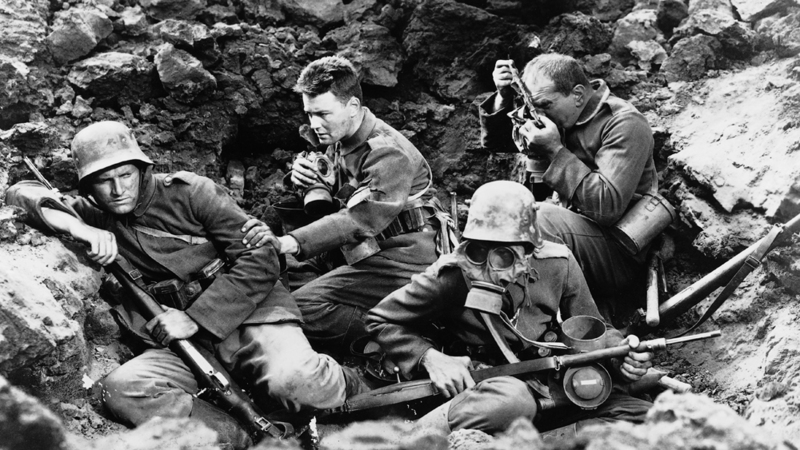 The legendary 1930 World War I film All Quiet On The Western Front, based on Erich Maria Remarque's novel, remains an essential achievement of anti-war art. The film's innovative sound design alone makes for a disorienting experience, one that director Lewis Milestone enhances with his visual approach. The central, anti-climactic battle scene arrives with little forewarning, and drills the viewer into a hypnotic trauma, as we lose track of the powerless protagonist, Paul Baumer (Lew Ayres), in explosions and fog. You can't even tell which direction the camera faces, and the opposed bodies blend together. Amidst the sea of dying boys, Louis Wolheim's depiction of the grizzled veteran Stanislaus Katczinsky remains a testament to humanity barely scraping by, as the war-ridden man cares for the teenage soldiers while barely surviving himself.